The Red Spot King Prawn is a reef prawn and is available year round with peaks from February to June. The NT fishery is closed from December to March and again in July. Look for brightly coloured, firm, intact, lustrous shells, without any discolouration, particularly at joints, and a pleasant fresh sea smell. 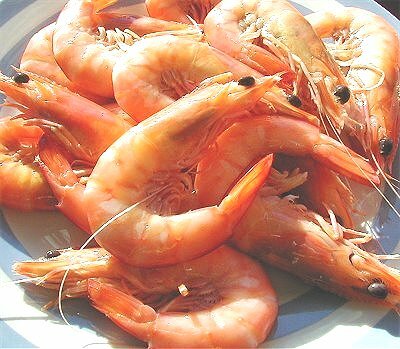 Prawns are highly perishable in their raw state and so are often frozen or boiled at sea as soon as they are caught. If cooking with Prawns, buy green (raw) Prawns, as cooked Prawns will toughen if reheated. The Red Spot King Prawn is a reef prawn – it likes to stay within 30 kilometres of coral reefs. Caught mainly in central Queensland from around the Gladstone to Bowen region, the Red Spot King prawn is a popular choice in Queensland seafood restaurants because it really quite attractive with a cute red spot on the tail section. Expect to pay a little less for Red Spot King Prawns than for Eastern King Prawns. Available year round with peaks from February to June. The NT fishery is closed from December to March and again in July. Commonly 40-50g and 10-21cm body length, with Eastern the largest and Redspot the smallest. Eastern can grow to 30cm. High priced, with larger prawns fetching the highest prices and Western and Redspot generally cheaper than Eastern. Barbequed Prawns (Shrimp) - Prawns marinated in a beer and herb sauce, bake and serve with crusty bread to soak up the sauce. Prawn, Asparagus and Noodle Stir Fry - Prawns with cellophane noodles, asparagus, ginger, spring onions and fresh coriander. Garlic Prawns or Shrimp - Garlic, white wine and brandy creamy sauce. King Prawn Salad with Chilli, Cucumber & Watercress - Thai style salad, very refreshing. Satay Prawns with Garlic Snakebeans - Shrimp marinated in a satay sauce and stir fried with snake beans.